Sweden has had a narrow escape. If last weekend's suicide bomber's plan had worked, his multiple explosives would have caused mass murder amongst Christmas shoppers in Stockholm. Swedish investigators have concluded that the Iraqi-born bomber, Taimour Abdulwahab al-Abdaly, had three devices and was probably aiming for maximum casualties. In the event, he triggered two explosions - a car bomb and one on his body - but he was the only one to be killed. Pointing to the fact that the second device went off in a relatively quiet street, Sweden's chief prosecutor Tomas Lindstrand said it had probably gone off prematurely. "He had a belt, he had a rucksack and he was carrying something and all these three things were bombs. And probably he did something by mistake. "And it's a qualified guess, I think, that he aimed to explode these bombs where there were many people gathered," he said. Abdaly appears to have been unknown to the authorities in Sweden. He emigrated there from the Middle East in 1992 then moved to Britain in 2001. 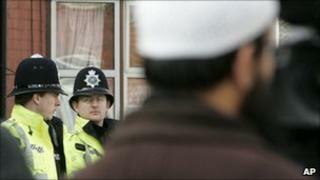 He does not seem to have been flagged up in Britain as being of any particular concern, despite being effectively evicted in 2007 from the Luton Islamic Centre by his fellow worshippers who challenged his violent, extremist views. But no-one reported him to the police and no-one in authority, it seems, detected his extremism from his postings on the social networking site Facebook. Despite the fact that he was the only one to be killed by it, his attack would have taken careful preparation and planning. It is similar to other failed attempts by jihadists to kill citizens in London's Haymarket and in the US. In a farewell message Abdaly boasted of going to the Middle East "for jihad". Investigators are now focussing their attention on whether he was a "lone wolf" operator or whether he may have had accomplices in the UK, Sweden and elsewhere, making him part of a wider network with possibly more targets planned. An Islamist website has already hailed him as a martyr, denying that his attack was a failure, and claimed that he acted to fulfil a pledge made to the Islamic State of Iraq, al-Qaeda's affiliate in Iraq, to punish Sweden for sending troops to Afghanistan and for allowing the publication of a cartoon insulting the Prophet Muhammad three years ago.